Manual business checks, available with carbonless duplicates. Choose from a variety of stub options to suit your accounting needs. Manual business checks are perfect for day-to-day business operations, and are often utilized as manual payroll checks as well. Checks are an integral part of running a business. Manual business checks work with general purpose small business processes. These small business checks will streamline your checking needs. Bank-A-Count offers two different styles of manual business checks: 3 to a Page Manual Business Checks and Duplicate Manual Business Checks. Each manual check is easily detachable in both check styles. 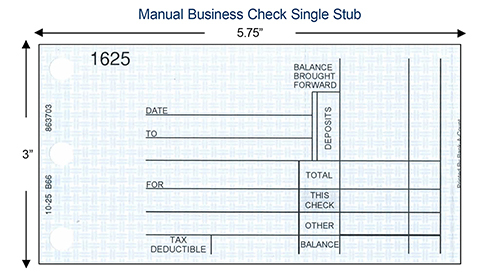 The manual check measures 3” x 7.25” when detached from the stub. Each manual check comes with four different record keeping stub options. The optional double stub has four additional choices. These stubs are a good way to stay organized and ensure accuracy when preparing taxes. Another way to keep your small business checks organized is to check out our Business Manual Check Binder. The checks are punched to fit a 3 or 7 hole binder. The convenience of our online ordering process will save you time and money on your small business checks. Once you place your first order, reordering is easy. Visit www.reordermorechecks.com to quickly renew your manual check supply. What size are the business checks? 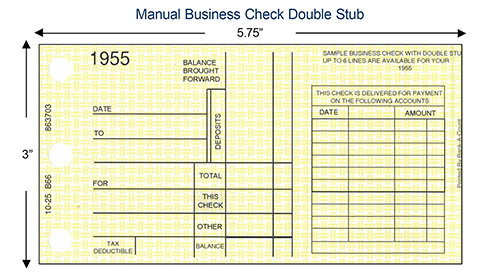 All our manual business checks measure 3” x 7.25” when detached from the stub(s) in both single and duplicate styles. What if my account number contains spaces or symbols? When entering the account number, click on the question mark located by the box. A pop-up guide will explain the various ways to represent these symbols or spaces. What is the number spacing? Number spacing refers to the distance between the routing number and the account number. Are deposit products and a binder included with the manual business checks? The deposit products and business manual check binder are purchased separately in a different product area on our web site. If you would like to purchase them together, there are manual check product bundles available. Once on the build a bundle page, select manual check bundles in the “select a category” dropdown. What is the difference between the two stubs? The first record keeping stub automatically comes with the manual business checks. A second detachable stub can be added as well. The total stub size area remains the same regardless if one or two stubs are selected.